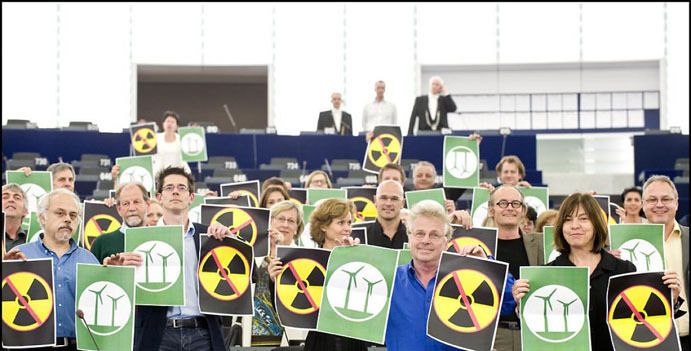 Despite Liberal claims, nuclear power will not save the environment http://rabble.ca/columnists/2018/10/despite-liberal-claims-nuclear-power-will-not-save-environment, Ole Hendrickson October 23, 2018 Want a shiny new nuclear reactor in your community? Justin Trudeau has a deal for you. In the lead-up to the 2015 election, he said the economy and environment “go together like paddles and canoes. Unless you have both, you won’t get to where you are going.” Such vacuous statements helped him win a majority government. Did Liberal voters think “real change” would mean maintaining fossil fuel subsidies, buying the Kinder Morgan pipeline, and promoting new nuclear reactors? Behind closed doors in the “clean growth” cabinet committee, the minister of natural resources will discuss next year’s “Clean Energy Ministerial” — a gathering of energy ministers from the world’s richest nations, hosted by Canada. One of Canada’s objectives for this meeting, together with the U.S., is to advance plans for the “next generation” of nuclear reactors. In preparation, a federal nuclear reactor “road map” will be released next month at a Canadian Nuclear Society conference in Ottawa subsidized by the Trudeau government. For the one-percenters, “clean growth” includes nuclear power. The military industrial complex needs nuclear power and nuclear weapons just as much as it needs fossil fuels. Government officials and lobbyists who call nuclear power “clean energy” cannot provide a shred of evidence that a new generation of reactors will help Canada and other nations achieve the Paris Agreement greenhouse gas reduction targets. Addressing climate change through economic growth is an ecocidal fantasy. To claim that humans can appropriate more and more of the planet’s resources, and still protect the environment and halt climate change is ludicrous. This is business as usual — continuation of the “great acceleration” created by post-Second World War governments who transformed the war machine into the “peacetime” military industrial complex. Politicians and corporate executives — the one-percenters — have no intention of putting the brakes on this machine. They need to fuel the nuclear sub fleets in the U.S. and U.K., and the armoured vehicles that Canada makes and sells to Saudi Arabia. They will try to extract every last gram of uranium and drop of oil. Nuclear and fossil fuels are both the means and end of war. Did Hungarian nuclear authorities fudge the measurement of water heating at Paks nuclear plant ? English version by Zsuzsanna Liptákné Horváth. 1 Nov 18 You can read the original, Hungarian-language story here. Hungarian police are investigating whether the water in the river Danube was warmer than 30 degrees at the Paks nuclear plant during the August heatwave. According to Hungarian regulations, if the water temperature reaches that point, the nuclear plant has to be shut off. It was not, but there is a suspicion that water temperature did reach 30 degrees. Hungarian MEP Jávor Benedekfiled a report at the police and now the case is being investigated.According to measurements by Átlátszó and Energiaklub, the temperature of the river Danube reached 30 °C during the August heatwave, exactly where the Paks nuclear plant’s cooling water enters the river. According to a 2001 government decree, the Paks nuclear plant must cease operations for environmental reasons if the temperature of the Danube reaches 30 °C anywhere in the 500 meters following the point where the cooling water is deposited into the river. The nuclear plant’s official thermometer never measured more than 30 °C in August, therefore the power plant or any of its blocks were not shut off. Concerned about the river’s ecosystem, MEP Benedek Jávor requested a police investigation. The first step that led to the current investigation was when Átlátszó and Energiaklub, a Hungarian NGO, measured the water temperature in August. Energiaklub had requested the official data about the river’s temperature before, filing a freedom of information request. However, during the time of the heatwave Paks stopped announcing their official data. Átlátszó’s group of experts had assumed that the temperature of the water rose above 30 °C. To prove this, and to protect wildlife in the river, we traveled to Paks and measured the water temperature. Before the point of entry of the nuclear plant’s cooling water, we measured 25-26 °C. Downstream, however, within 500 meters from the cooling water’s entry point, we measured above 30 °C at multiple locations. We took a video of the process and published an article about our unofficial data. These show that at every single location downstream where we measured the river’s temperature, it exceeded the 30 °C. Cadarache [Bouches-du-Rhone] a carte blanche. But it is not safe. degrees Celsius. But it’s the wrong question. Yes, the path we’re on is ruinous. It’s just as true that other, plausible pathways are not. humans can live in a world better than the one we have now. missing how much scope for action there still is. reelection race against Democrat Jacky Rosen. building the Yucca Mountain nuclear waste repository outside of Las Vegas. national repository for higher activity radioactive waste. asked SKB to provide additional information by 31 March 2019. North Korea warns of returning to nuclear policy, News 24 2018-11-04 North Korea has warned the US it will “seriously” consider returning to a state policy aimed at building nuclear weapons if Washington does not end tough economic sanctions against the impoverished regime. “The word ‘byungjin’ may appear again and the change of the line could be seriously reconsidered,” said the statement carried by the official KCNA news agency late on Friday. The statement is the latest sign of Pyongyang’s increasing frustration with Washington……..
U.S. Secretary of State Mike Pompeo says he is resuming denuclearization talks with North Korea this week in New York, meeting with Pyongyang’s second in command, Kim Yong Chol. Progress on ending Pyongyang’s nuclear weapons programs has slowed in the months since the Singapore summit in June between U.S. President Donald Trump and North Korean leader Kim Jong Un, when the two leaders signed a general statement calling for the denuclearization of the Korean peninsula. But Pompeo called the coming talks “a good opportunity” to move toward specifics of when and how North Korea might end its nuclear weapons program. The United States is seeking to finalize a deal by the end of Trump’s first term in office in January 2021. Pyongyang said Friday it would “seriously” consider resuming its nuclear testing if U.S. economic sanctions against North Korea are not lifted, but Pompeo, in an interview on Fox News Sunday, dismissed the threat……..
Pompeo said there would be “no economic relief until we have achieved our ultimate objective,” the end of North Korea’s nuclear program. BY BOB BERWYN, INSIDE CLIMATE NEWS, 31 OCT 18 Greenhouse gases are increasingly disrupting the jet stream, a powerful river of winds that steers weather systems in the Northern Hemisphere. That’s causing more frequent summer droughts, floods and wildfires, a new study says. That would change the temperature contrast between the Arctic and mid-latitudes, which would dampen the warming effect of greenhouse gases on the jet stream. By how much depends on the rate, location and timing of the reductions, and the offset would end by mid-century, when man-made aerosols are expected to be mostly gone and no longer reflecting incoming solar radiation, said Pennsylvania State University climate scientist and study lead author Michael Mann. ……….